Rotterdam is a real student city. At the Erasmus University Rotterdam are several colleges and highschools and follow many students an education. 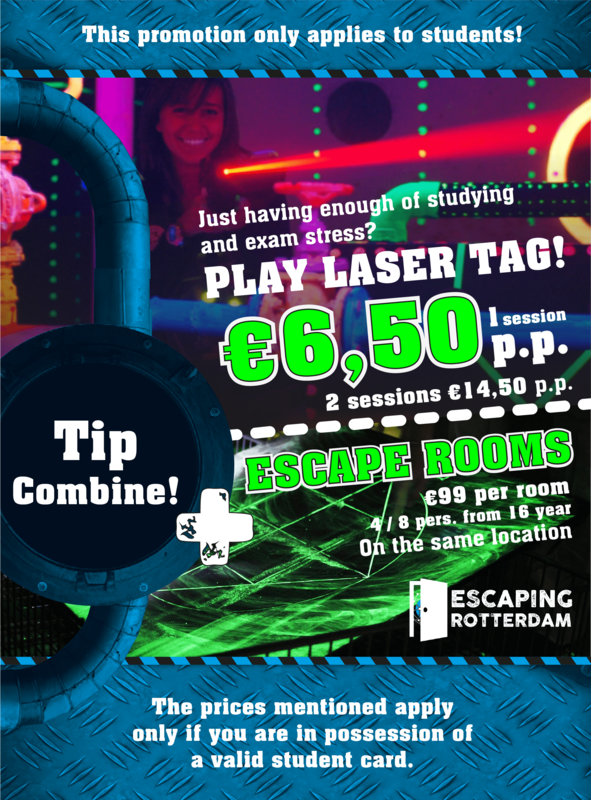 Lasergame Rotterdam had specially for students package and prices. So make use of your student pass and play lasergame with discount. Once in the arena you step into another world. Stress, exams and credits fade away. Surrender to the battle and go absolutely wild! Students & 1x Lasergamen € 6,50 p.p. Students & 2x Lasergamen € 14,50 p.p. The students package are specially for students. After an explanation you can play 2 sessions with a short break between game. The prices above are only valid if you are in possession of a student card. For our opening hours, click here!. This arrangement is possible on Wednesday and Thursday from 17:00 pm and on Sunday from 19:00 pm.